– Full UK reg. & fresh MOT. The Fulvia was produced by Lancia between 1963 and 1976. Named after Via Fulvia, the Roman road leading from Tortona to Torino, it was introduced at the Geneva Motor Show in 1963 and manufactured in three variants: Berlina 4-door saloon, 2-door Coupé, and Sport, an alternative fastback coupé designed and built by Zagato on the Coupé floorpan. Fulvias are notable for their role in motorsport history, including winning the International Rally Championship in 1972. On testing a Fulvia in 1967, Road & Track summed it up as “a precision motorcar, an engineering tour de force”. Designed in-house by Piero Castagnero, the coupé used a 150 mm (5.9 in) shorter wheelbase than the saloon model, sharing it with the Zagato bodykit. Delivered brand new in Rome in 1971, this Fulvia has had 3 former keepers, as certified on the Italian ‘libretto’ logbook. It has been kept in immaculate conditions, each of the owners has taken every step to take care of this car from the double set of original keys, to original parts that the car still retains nowadays. Original style number plates with the correct identification number have been retained on the car and match its show winnings cards which complement the history of this car. The restoration was carried out by the last owner, maintaining the car as original as possible. In fact, its Amaranto di Montebello coated body with its 1.3 V4 original matching numbers engine make this car very unique and a collectible item for enthusiasts. Hours have been spent on the bodywork to prevent it from any future corrosion. The work started with smoothening the body taking it to a bare metal shell state. Secondly, an anticorrosion prime coat was applied to then coat it in its gorgeous vine colour, which, to this date, shines egregiously in the sun. The aim of retaining its originality was applied when restoring the interior too. The leather seat covers show no sign of excessive use and there are no wear and tear signs on the carpets, dashboard or interior panels all around the car. The body is very straight, all the curves follow the shape of the car and all straight lines show no signs of readjustment. The gaps around the car are great and all even. Doors, windows and trunks shut tight and with no effort or second trial. Its coat of Amaranto di Montebello vine paint looks as good as when it came out the factory in Italy. All exterior parts have been replaced or restored. Small details such as side indicators and its original Carello headlights show no sign of a tumultuous history. 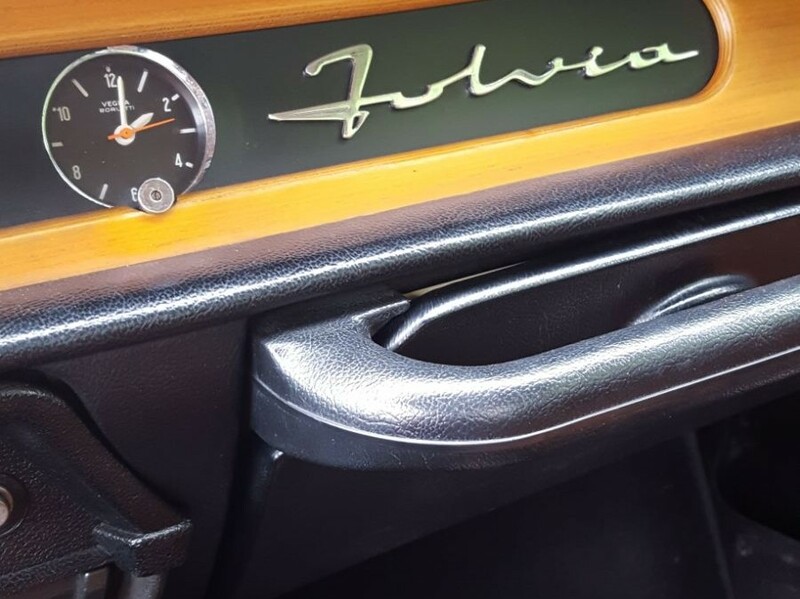 All the chromed accessories are without a doubt fresh and all shine in the sun and all have been replaced or restored during Fulvia’s overhaul. Every small detail has been taken care of when taking this car back to the original conditions of the 70’s, including the bonnet and boot light, lenses (still original!) decals and logos are all shining and placed in the correct location. A rare and original Cromodora racing wheel set accompanies the car with fresh tyres (fitted). Its original set of wheels (and tyres fitted) comes with the sale too, in order to maintain the car original and complete. The leather seats are in excellent conditions throughout, both at the front and the rear. All the door cards and panels retain a straight shape, a great colour and are not stained like most. The dashboard shows no signs of time having no cracks and has not faded with the hot Italian sun. The wooden steering wheel has been restored; it is very smooth and has a very good feel to the hand. The wooden dash and dials still look great too and complements the rest of the wooden touches very well. 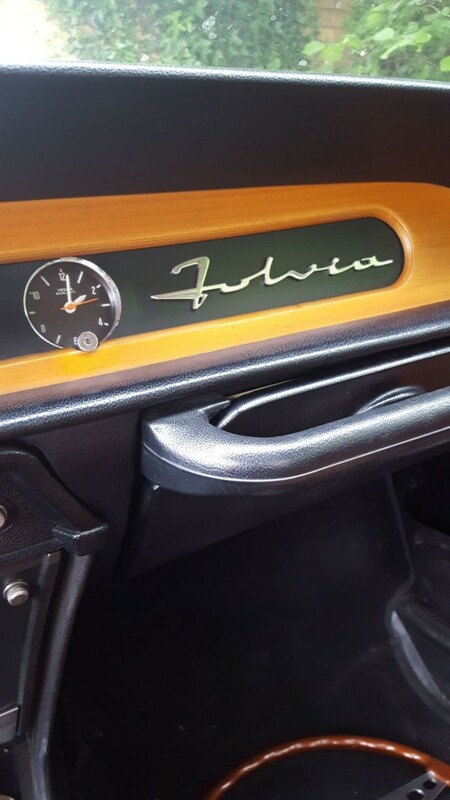 Small details, have been taken care of in the interior too – the clock for example – is still working great. Door locks, switches and dials are all there and are all working great. The indicator stalk retains its original shining glory resembling Ferrari’s ones. All the interior parts feel good to the hand and it can be clearly noted that the car has not been misused or careless behaviour was applied when restoring it. A great deal of expertise and capital was invested in the car to retain its original parts and find a like-for-like replacement for those missing. Lancia has been made famous through its V4 and V6 engines. Its pioneering V4 narrow angled block uses using very shallow V-angles — between 10° and 20° (13° for the Fulvia) — both rows of cylinders could be housed in an engine block with a single cylinder head, like a straight engine. The production of the V4 engine started with earlier models and ended indeed with the Fulvia. Adjustments and redesigns of the block over the years meant that the final Fulvia-mounted V4 was finely tuned to perfection and was good as it was ever going to be: The engine was a true DOHC design with one camshaft operating all intake valves and another operating all exhaust valves realising an output of up to 80bhp! A true work of art was carried out when restoring this engine. This matching numbers V4 engine has been recently serviced and tuned in the UK, starts at half a turn of the block and fires at all 4 cylinders immediately. The twin Solex carburettors ensure its originality and their restoration ensures that no flooding or leaks have an impact on the performance of this engine. Runs perfectly at both hot and cold conditions and breaths excellently at high speeds. No smoke of any colour is present at start and sounds just excellent. Every gear clicks in place at first try and its power braking ensure a pleasurable Sunday drive as well as the occasional track-day race. Rear brakes have also been serviced in the UK by specialists and guarantee a safe and orderly braking, but also a peace of mind when leaving the car with a functioning handbrake on. Overall, this Fulvia is for both collectors which are looking for a trailer queen investment, with original parts throughout and an enthusiast, which truly knows how to enjoy its powerful 1.3L engine. The combination of both creates one of the most desirable Fulvias in the UK. Come and hear the sound of this beast yourself and take it for a test drive to be catapulted back in time.